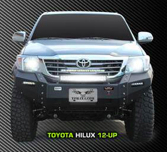 Have a new HiLux and looking for an excellent solution for front armored bumper? The first, and the best! Look no further than VPR! Made to handle the biggest of winches! Please contact for freight quote & availability. Copyright © 2019 Extreme Landcruiser. Site design by NetThink 21.